GE Healthcare and MedImmune have ordered Valitacell’s maiden product. EARLY-STAGE MED-TECH startup Valitacell has attracted two multibillion-euro biopharma firms as its launch customers. Valitacell co-founder and chief executive Terry McWade told Fora that GE Healthcare and MedImmune, which is part of the AstraZeneca group, have ordered its cell-testing technology, ValitaTiter. The ValitaTiter kit allows biopharma firms to test cells at an earlier stage in the manufacturing of biological drugs, the type used to treat cancers and inflammatory diseases. Biological drugs are more difficult to make than synthetic drugs because the antibody that fights the disease is produced through living cells, instead of a chemical concoction. Scientists may have to test thousands of living cells to see which ones are capable of producing the key ingredient. McWade, who trained as a medical doctor before trying his hand as an entrepreneur, said the ValitaTiter technology “allows those drugs to come to market quicker and give more patients access to them” because the development phase is sped up. He said the testing of living cells takes 12 to 18 months to complete and costs around $2.3 million per screening. He claimed ValitaTiter, which retails at €40,000, cuts that time and cost by half. “What we do is provide technology that allows that screening to take place at a much earlier stage and much quicker,” McWade said. Screening for living cells is a routine, recurrent test that a firm would do up to 70,000 times a year, he said. But the products currently on the market are “much higher tech and much higher specification” than what is necessary. As well as GE Healthcare and MedImmune, Valitacell is preparing to trial its product with two multinational pharmaceutical companies that are listed on the London and New York stock exchanges. The biopharma drugs sector is worth about $210 billion, according to healthcare analysts QuintilesIMS. It expected to swell to $278 billion by 2020. 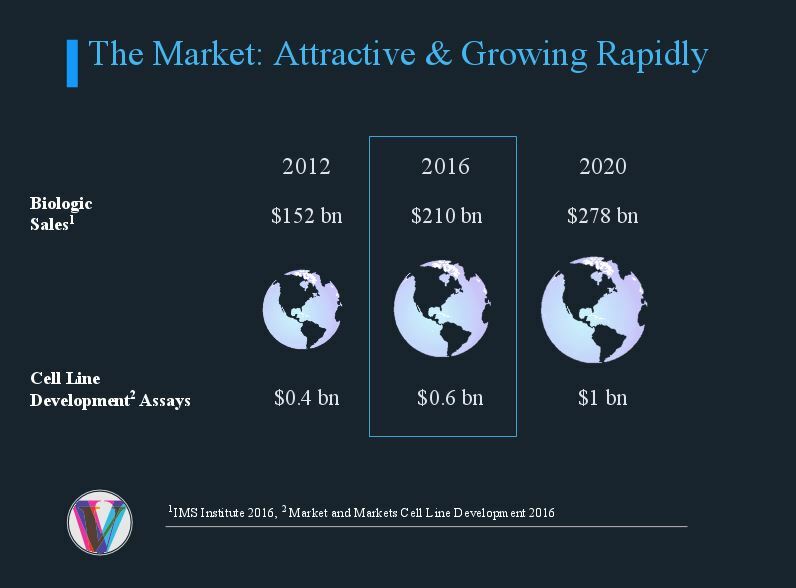 Cell-line development, the market segment that Valitacell is chasing, will grow from $600 million to $1 billion over the next four years. “By 2019, we would think we’d be in the region of €4.5 million turnover,” McWade said. “That creates a platform that we can rapidly accelerate once we have a number of these high-reference customers shown that the products work. Valitacell recently won the overall 2016 Seedcorn InterTradeIreland award – and in the process picked up a €100,000 cash prize. McWade said the money will be spent on recruiting more marketing staff and has eased the startup’s move from its Pembroke Street office to a hub in the National Institute for Bioprocessing Research and Training in Blackrock. Valitacell has raised €1.4 million to date from a number of investors, including its now-chief financial officer and former Elan executive, Peter Thornton. The startup will be looking to raise another €2 million in 2017 to fund the rollout of both the current product and to speed up the launch of its second offering, which will use chemicals to replicate the stresses that cells experience when they are being developed into drugs.